...this is were the term 'bird brain' comes from. Some don't ever give up. I had a house finch that came every year and wanted to put home behind a light outside my front door. I had to roll a towel up and put it there to stop it. I guess she decided that was the only place she could keep her nest! She must feel safe there. Maybe you will be able to see baby chicks! Oh, how adorable!!! And now you can wait for babies! You gotta admit she is one determined bird. But if you think about it, that is a really good soft place for a nest. None of that wood for her! This does kind of sound like a house finch. They will build in the same place over and over no matter what happens. Keep us posted! LOL... we've got them all over!... a nest in my barn, a nest in two of the birdhouses in the yard, a nest in the porch lantern, a nest on Stella's porch too! Adorable, and hopefully you and the boys will be able to watch any babies fledge later - always fun. 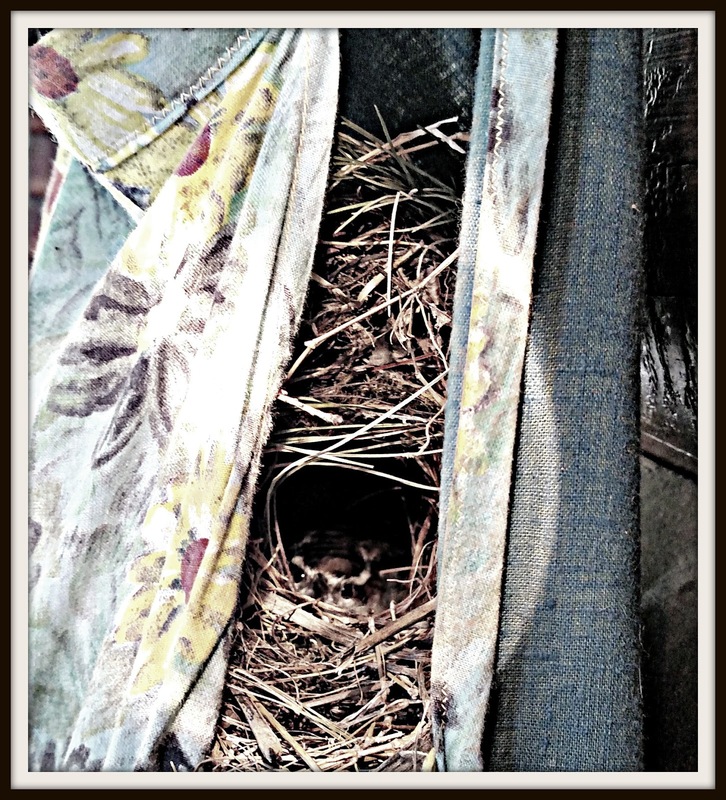 Must be a wren - they always build with a side entry - and their little ones are sooo cute!
! do still have a 'peg bag' full of old wooden pegs - comforting to look at, many memories! Just back from Italy - summer in NC very wet here this week - hope the mountains your way are beautiful. The bird said " I shall endeavor to persevere." I like to watch the birds in the forest in the morning, while I have my coffee on the porch. I only know the common ones, but it's pleasant to see them flitting around and going about their business. Awww....but they'll be gone soon enough. That's so sweet! We have a bird in the shed, one at the pond, and the owl in the cavity! LOL, funny little critter! You could probably buy more clothes pins. LOL Looks like the bird has won! sorry but your right - that bird did win. THis made me laugh- some birds are so determined! I guess the bird just knew it would win if it was persistent!